Today, Blogger Team has made some delightful changes in Blogger’s Default commenting system. The changes are not in terms of functionalities, but they have revamped its design. So far the changes are not that significant because we have only noticed minor changes in the buttons of Blogger’s Comment Editor. The main reason behind redesigning the comment editor could be its old fashion appearance because, after introducing Blogger new interface they make lots of updates to Blogger like Google Dynamics, Google+ Followers Gadget, but they never given any regards to their Comment editor. Though, in 2012 they introduced Threaded commenting system but that was not robust enough. Finally, Google is doing some experiments with the comment editor which we will discuss in today’s Article. As we have mentioned above, the changes are neither significant nor minor. They have just reshaped the “Publish”, “Preview” and “Comment as” buttons. The design is a bit inspired from Google+. The appearance of the buttons is extremely professional and suites color scheme of almost each and every blog. Check out the following screenshot to see the difference between OLD and New Comment editor. Still, we cannot rate it as the finest Comment editor because the Blogger Team is working on it. This is the reason, why it is catching errors when we try to visit our site with Firefox. However, with Google Chrome it is working fine. Blogger is yet to make any announcement about the redesigning on their comment editor. The Design looks alike Google. Therefore, possibilities are high that, they might change the Blogger’s default commenting system with the blossoming Google. These are all our predictions because from its appearance it looks like our prediction might be true. Nonetheless, let us wait and see what is going through in the brains of Blogger Engineers. If anyone is thinking, how we knew that Blogger has redesigned its comment editor, then Scroll down the page and witness the awesomeness. We are just like every other webmaster, so Google do not provide us with special treatment. These sorts of updates are extremely noteworthy for a prominent future because Google is giving regards to the world most used Blogging platform. There was some news that they might shutdown the platform, but after the recent changes they have declined all the rumors. What are your thoughts about the update? Feel free to leave your opinions. Take care of yourselves till then, Peace, Blessings and happy commenting. 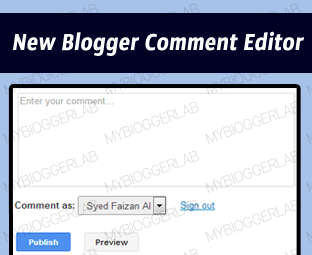 i think blogger should change it, this commenting system should like Facebook's Commenting system ! Google Team always the best. It Doesn't matters because it works on every Commenting system. Even the MBL one. You Have Been Caught Sharing Copyrighted Content From MyPremiumTricks. Remove it and any previous posts immediately otherwise you have to face DMCA. I Agree with @Mehul. You are also copying our Copyrighted Gadgets. We would give you 24 Hours to Take down all the content. If you failed to do so. We have nothing to Ask Google to Blacklist your site. I have writes on his comment box also Syed ! "These Peel effect was devloped by Syed Faizan Ali of mybloggerlab.com, at least give credit to him !" i want to remove the sharing option below the post (which is default) can you please help.